CHICAGO--(BUSINESS WIRE)-- Hyatt Hotels Corporation (NYSE: H) announced today the official opening of Hyatt Regency Chandigarh in Northern India. 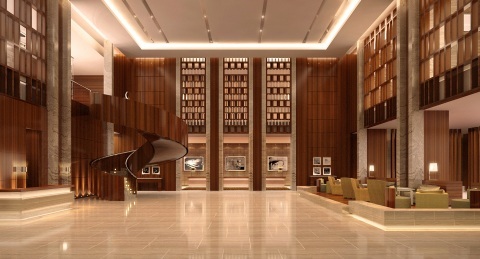 Located 153 miles (246 kilometres) from India’s capital of Delhi, Hyatt Regency Chandigarh is the first Hyatt-branded hotel to open in Chandigarh, the city planned by world renowned Swiss-French architect and planner Le Corbusier. As part of the Hyatt Regency brand, Hyatt Regency Chandigarh has been conceived to foster connections and serve as a dynamic, energizing space where guests can collaborate, share and find inspiration. The hotel is central to the city’s business hub and is part of a premium development that includes the Elante Mall and an office complex that houses key multi-national companies and diplomatic missions. With excellent links and travel connections, the hotel is a 20-minute drive from Chandigarh International Airport and eight minutes to the Chandigarh Junction railway station. The hotel’s 211 generously sized guestrooms, including 25 suites and seven Cabana rooms, are characteristic of Le Corbusier’s design elements, including contemporary furniture, inspired artwork and colorful carpets. Each guestroom overlooks the serene cityscape, pool or landscaped gardens and offers amenities to meet the needs of today’s business and leisure traveler, including a luxurious bed, iHome®, 42-inch LED TV, mini bar, a separate shower cubicle and bath tub, generous work desk with enhanced lighting, complimentary high-speed Wi-Fi, premium bath amenities, concierge service, and 24 hour in-room dining. Hyatt Regency Chandigarh features five restaurants and bars that span the culinary globe. From authentic Northern Indian dishes to Chinese cuisine, Western fare to classic Italian, the hotel provides multiple options for quick drinks, business lunches, intimate dinners or casual dining experiences – all offering culinary experiences designed to inspire food lovers. Urban Café is a multi-cuisine restaurant that features a selection of Northern Indian, Chinese, Middle Eastern, and Western cuisine. Traditionally designed tandoors, sizzling woks and grills create a lively and interactive ambience. In addition to delectable cuisine, the restaurant showcases a premium wine selection and a fine whisky bar, as well as a selection of specialty teas and coffees. The hotel’s vibrant and chic 24-hour café, Browse, is an ideal place to network, share ideas and conversation, relax, and be inspired. The versatile environment of Browse allows guests to use the space for casual business meetings, connecting with friends or planning events for all occasions. It serves an eclectic mix of Indian and international cuisine specialties in a relaxed ambience with hot and cold beverages. Expected to open in early June, Piccante will be the hotel’s signature Italian restaurant and will offer authentic regional delicacies from Campania and Sicily in a vibrant and stylish atmosphere. Featuring a private dining room that overlooks the beautiful rooftop terrace and an al fresco seating area, the restaurant’s show kitchen will feature a classic wood-fired oven that adds a unique flavour to the pizzas. At Piccante, strong emphasis will be placed on authentic produce and fresh and sustainable seasonal ingredients, along with time-honored recipe classics. Stage, a lively bar with a modern, informal residential feel, will open in early June, and will be the place to celebrate a business deal or to reconnect with old friends and make new ones. The bar will offer the finest collection of scotches, cognacs, single malts, bourbons, Irish whiskeys, vintage champagnes and wines, and up-market spirits and liquors, all complemented by up-tempo lounge music and an authentic and thoughtful selection of Italian spuntini-style cuisine. The Pool Bar is the perfect place to enjoy refreshments while soaking in the temperature-controlled outdoor pool. Set in an ambience of serenity and beauty, it serves refreshing and innovative cocktails, comfort foods, delicious grilled dishes, light salads, and home-made ice creams. Hyatt Regency Chandigarh presents a perfect venue for a variety of events such as weddings, social banquets, exhibitions, meetings, and conferences in the heart of the Tri-City. With more than 36,000 square feet (3,345 square meters) of flexible meeting and event facilities, including an 8,711 square foot (809 square meter) pillar-less ballroom, Hyatt Regency Chandigarh provides thoughtfully designed, individual, sound insulated meeting rooms that can be linked together to create a unique conference capsule capable of accommodating multiple breakaway seminars simultaneously. Opening in early June, Amaira Spa will provide a holistic approach to health and fitness by focussing on a balanced mind, body and soul. Guests’ health needs will be met at the hotel's recreational facilities, which will include a 24-hour fitness center equipped with cardio and strength training equipment. The Amaira Spa wellness journey will create an energizing experience by providing an exceptional blend of pure ingredients and ancient Indian therapies with modern techniques. Highly personal in its approach, each guest’s spa experience will be developed through thoughtful consultations with trained experts, resulting in a well-choreographed, unique wellness experience. Hyatt Regency Chandigarh is offering a special opening rate of INR 5,999 for standard guestrooms, including breakfast. For full offer details, including terms and conditions, or to make a reservation, please visit chandigarh.regency.hyatt.com or call +91 172 440 1234.